Each year, Social Work Today asks its readers to nominate colleagues, coworkers, and mentors for the wonderful things they are doing in the field day in and day out. Every year the essays pour in and we are humbled and amazed by the stories that we read of efforts that have long gone unrecognized. It is our hope that with this annual feature we can recognize a sampling of some of the amazing work being done by social workers like you. We're honored to share the stories of the 10 finalists here. From the time he was just a young boy taking apart the family stereo to try to "figure out how it worked," Russ Anthony has had a passion for technology. As an undergrad, he majored in communication with a concentration in broadcasting. But after graduating, Anthony says he worked in a nursing home for several years, where an administrator told him he would make an excellent social worker. He returned for a master's and ultimately went to work in social services. When he recognized that many of his colleagues were struggling with the rapid adoption of technology that was required of them, he realized he could combine his two passions: technology and people. "If you don't have that technological background, it can be hard to have to adopt a lot of computer work or understand software programs," Anthony says. "So I've really found a role in providing technical support that helped our agency avoid having to always call in the IT [information technology] crew." In adopting many technical roles, Anthony also discovered a disconnect. The social workers at the agency were excellent at working with people but struggled with the technological skills, while the IT folks struggled to communicate. As a liaison between the two, Anthony says he's also assisted the IT administrators in "communicating better." In addition to his work at the agency, Anthony also started his own business to help assist other individuals and organizations in getting the most out of the technology they're using. 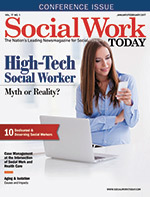 He coined the term "social work technologist" and uses it to describe his hybrid role as a social worker/technology guru. While he has very little free time, Anthony dedicates a lot of it to volunteer work. Among several causes he supports, Anthony enjoys being involved with Ride 2 Thrive, an annual event that provides community awareness for the public with access to information, resources, health screenings, and more. Anthony has volunteered his time as a videographer to document the event and spread awareness. "I love the idea of being able to translate to people what happened at an event they weren't able to attend," Anthony says. "There's so much more to it than just hitting 'record.' What I love is the editing and the way we're able to best present what took place so that even people who weren't there can be reached with an important message." As a school social worker, Robin Dycus frequently deals with teens going through tumultuous times. Dycus admits she often hopes she made a difference but doesn't always know what happens to her students after graduation. To keep her going she thinks of the "The Starfish Poem," in which many starfish have washed up on shore and each needs help. In the poem, though the young protagonist can't help them all, he knows he made a difference to each one that he is able to throw back in the water—and that's what keeps him going. Though she doesn't always have confirmation that things worked out, Dycus likes to believe that she played a supportive role in her students' journeys. Still, Dycus admits there's nothing quite like a former student running up to her for a hug for that sense of affirmation. "That's when you know you've had some kind of impact," Dycus says. "So often I'm surprised that it's the kids I felt like I wasn't getting through to. Those moments keep me going on days that I feel less confident." Though she's humble, Dycus has undboutedly reached countless students during her 15 years as the school social worker. In that time, she has worn many hats. But no matter what role she's playing, Dycus always goes the extra mile. That may mean sitting for hours with a student in crisis, getting up early on a Saturday morning to write a grant for a Summer Camp program for middle school teens, or being a mediator during a fight. No two days are alike. Dycus admits it can be stressful but says helping teens is a passion. She says her own experiences as a teenager played heavily on her decision to pursue social work. As a junior in high school, Dycus became a teen mom, and says that her family was not very supportive. She knows firsthand how difficult it can be to navigate a challenging situation without a lot of support. "The teenage years are hard enough without an added crisis," Dycus says. "That whole experience led me to want to be an advocate for young people—someone that they know will be there for them in their time of need." As a school social worker, Ann Hobbs believes that education can be a bridge out of poverty and works hard to provide support for all of the students she works with—some of whom live in extreme poverty. In addition to working in the classrooms to support teachers, Hobbs assumes roles including providing home visits and counseling services. She says her hope—even if students don't remember her specifically—is that they will remember feeling a sense of safety and security at school. "Sometimes with the youngest kids, their biggest problem is just that they miss their mom, so my job might be as simple as sitting and talking with them," Hobbs says. But Hobbs works with kids with challenges all over the spectrum including mental health issues or even child abuse at home. Like many social workers, she's seen it all. But she keeps going, knowing the importance of providing support to these kids. Among many duties, Hobbs oversees the social work interns that are placed at the school through a grant. She also runs a violence prevention program that teaches social and emotional skills, including empathy and problem solving, to kids. In addition, Hobbs leads Incredible Years, an evidence-based program at the school, comprising a group of five or six kindergarteners and first graders who have been identified as having challenges. Hobbs says this intervention curriculum is meant to work through some of the issues that these kids face, in the hopes that they learn strategies at a young age. "I feel that the earlier you can impact a child's life, the further the ripple effect can be," Hobbs says. "That's one of the reasons I do really enjoy working with the younger kids." Virna Little says she is passionate about organizations that build clinically excellent and financially viable behavioral health services. A program needs to have both in order to be truly successful. Little says there are tremendous opportunities for social workers within that kind of model. As part of the Institute for Family Health, a mission-driven health organization, Little is part of the largest community health center network in New York and one of the largest behavioral health centers in the country. But she says that when she arrived two decades ago, she was one of the only social workers in the practice and worked hard to build the department. Today, the department has more than 300 social workers. "I have always been committed to bringing more social workers into community health centers in order to build up their mental health services," Little says. "In the next decade, the largest employer of social workers is going to be community health centers." In her career, Little has been focused on the integration of primary care and behavioral health and has worked both nationally and internationally to develop behavioral health identification and treatment programs, viable behavioral health services, and integrated care systems. She has also been a pioneer in suicide prevention, and her commitment to integrated care has led to the adoption of suicide prevention programming at the Institute for Family Health. "Many individuals may not be connected to mental health services but have a primary care physician that they were seeing prior to their suicide," Little explains. "That's why it's so important for primary care physicians to work with a suicide prevention model. We've done some things with both electronic medical records and training to focus on prevention." A true advocate for suicide prevention and mental health services, Little says she also remains incredibly passionate about encouraging future social workers. "There are few degrees out there that can give you such a broad base of clinical, people, and networking skills," she says. "A social work degree today gives you a vast array of opportunities. It's a very exciting time for the field." Known as a longtime lion among social workers, Floyd "Shad" Meshad represents the very best of veteran advocacy. But Meshad says he actually started out on the track to become a priest. Raised Catholic in the South, Meshad went as far as the seminary in Alabama when he recognized he wasn't cut out for that kind of "religious structure." One of his professors, recognizing his people skills, encouraged him to pursue social work. After graduating with an MSW from Florida State University, Meshad went to Vietnam as an Army captain serving as a psychiatric social worker for thousands of troops. After being seriously injured in a helicopter crash, Meshad returned to the United States in 1970 and began working with Vietnam veterans, doing street outreach and cofounding the VA's Vet Centers, where veterans had a place to go talk about their experiences. Meshad says that back then, what we know today as PTSD was being diagnosed as schizophrenia; soldiers were being heavily medicated as a result. Meshad was instrumental in defining PTSD for what it really was and ensuring that patients were properly taken care of and evaluated. Meshad also founded the Vietnam Veterans Aid Foundation, which later became the National Veterans Foundation. Today, the organization has served more than 400,000 veterans, primarily through their crisis hotline, a "Lifeline for Vets," which provides veterans in crisis or living on the margins with access to fellow veterans who can help them navigate the system, connect with benefits, and access housing or health care. Today, at 72 years old, Meshad says he "hasn't stopped." He says he's blessed with a lot of energy and "will go to his grave fighting the battle for veterans." Meshad says, "There's still so much work to do. Vietnam veterans are now in their 60s and 70s and have a lot of medical issues. We often find many who are suffering from war but never even filed a claim. I'm not one to sit back and just talk about these problems. I'm an activist and I will always be one." Although she had obtained a bachelor's degree in Mexican American studies, Verónica Obregón says she always had a passion for social justice issues but thought she might want to go into psychology. However, it was a career mentor who suggested she look into social work. Obregón says that she knew this kind of work would be what "made her heart beat." After graduating, Obregón went to work as a school social worker, providing assistance in a program that was meant to support teen parents and their babies in a high school-based infant center. Obregón says it was incredibly rewarding, as the teen moms were able to stay in school and also received much-needed support. She found herself relating to a lot of the young moms and admits she was heartbroken when the program was impacted by budget cuts. Obregón says at that point she returned to school to "sharpen her craft" and better understand the system. Upon returning to the field, Obregón took a position with the Los Angeles Unified School District in the Parent and Community Engagement Office where she trains staff in evidence-based practices that engage parents as equal partners in students' academic lives. "Research shows overwhelmingly that when parents are involved and help create a home learning environment, those children will succeed in school," Obregón says. "That is so important for children of color who are growing up in poverty. When parents are involved, it's like a vaccination, and they will be able to overcome their situation to get the education they need." Obregón says it's an area of social work that she believes is underrepresented. So often social workers primarily wear their mental health hats—and that's certainly critical. But Obregón says that there are so many other ways social workers can have an impact on the school system, whether it be on developing policy, program development, or even designing curriculum. For her personally, Obregón says, "Education has been empowering." Born in Mexico City and raised in East Los Angeles, Obregón says it was the support of her own family in her pursuit of education that made such a huge difference in motivating her. "Parents or caregivers are the strongest motivator for a child's success," Obregón says. "They already have the tools they need to inspire and motivate that child. They just need to harness that love and support so that the child can sustain their goals. Without the support at home, it is much less likely to happen." When Sheridan Quarless Kingsberry's parents emigrated from Grenada, they became incredibly active in their new community in New Jersey. Quarless Kingsberry calls it "social work without the degree," and says that was really her first exposure to the field. She credits her parents and her maternal grandmother for instilling in her a desire for education and a passion to serve. To this day, Quarless Kingsberry says it "boggles her mind" to think of how far she's come. "If you would have told me back then, growing up in my small community, that I would be a professor one day, I wouldn't have believed it," she admits. "I'm so grateful for the opportunities I've been given, which is why I give back." But to just call it "giving back" sounds small. In truth, Quarless Kingsberry has dedicated her very little free time to serving others. She has been part of many mission trips including a 2014 trip to Antiqua to offer mental health services and deliver resources to underserved villages. She has also recently been to Trinidad, where she says she helped serve 1,800 people in just three days and says she was fascinated how desperate and thankful the people there were for mental health services. Quarless Kingsberry is also committed to helping countries in Africa and has a trip to Botswana planned in June. In addition to her work abroad, Quarless Kingsberry has also volunteered much of her time here in the United States. That has included assisting the Wilmington HOPE Commission in providing children of incarcerated parents with mental health care. She has also served on numerous boards including the NASW Delaware Chapter, the YWCA Delaware, and the Delaware Serviam Girls Academy, to name a few. There is a common thread in her passion for providing education. "I really believe in educating young girls and working with people who are not from privileged backgrounds," she says. "It is my belief that if you educate a girl, you educate the family. Therefore a lot of my work is focused on that. Women's education is one of the biggest factors in moving a family out of poverty." Sherry Saturno is on a mission to show the world that a social work degree is just as highly desirable as an MBA in today's marketplace. It's her belief that social workers can do almost anything with this diverse degree, and she's been demonstrating that not only in her own practice but also through Human Investment, an award-winning documentary that showcases what drives social workers to invest themselves in the humanity of care. The film won the 2016 NASW Media Award. "In the film I completed a series of interviews that weaves together a compelling narrative about what drives professional caregivers to work so hard even when they're not getting the recognition they deserve," Saturno explains. "I loved turning the focus on the caregiver where so often these individuals aren't recognized for what they do." Saturno herself has held a number of roles within the social work field. Last year as a national fellowship recipient at New York University Silver School of Social Work, Saturno researched an on-site case management pilot program that involved collaborating with insurance companies to provide case management support. The result was a reduction of rehospitalization rates and greater community support for underserved clients. Following the pilot's success, it was taken from the pilot stage into an actual program in New York State, and Saturno says she feels it demonstrates how critical social work intervention is at every level. Saturno currently works in long term care management and recently received her license to be a nursing home administrator. "I think most people automatically think of clinical work when they think of social work, but the fact is that social work can encompass everything," Saturno says. "It's a diverse degree that is highly attractive in today's field. Social workers can work side by side with insurance companies, with businesspeople, with armed services, or they can even run their own organizations. Social workers can do pretty much anything!" While in high school, in a time that Alina Tello-Cordon calls "less accepting," she was "outed" to her family before she was totally equipped to handle the situation. But Tello-Cordon says that an amazing social worker at her school provided incredible support and even encouraged her to start a gay/straight alliance group—something that was not common at that time. Through that experience, Tello-Cordon became passionate about advocacy and decided to pursue social work herself. After getting her master's degree, Tello-Cordon worked at a women's homeless shelter and found that many of the women identified as LGBTQ. Some were pushed out of high school or even their homes and were ostracized by the communities they lived in. Tello-Cordon says the experience was "eye-opening," as she fully came to realize what could have happened to her had she not received support. "I am so grateful for a social worker coming into my life and helping me find my path," Tello-Cordon says. "My experience at the homeless shelter made me even more grateful for the support I had in my life and more dedicated to providing it for others." While there, Tello-Cordon created Rainbow Lotus, a trauma-informed program to provide support to the LGBTQ members of the shelter; she says the program is still used today. At press time, Tello-Cordon accepted a new position as coordinator for Project Phoenix at Camillus House, a nonprofit agency serving the homeless. She will be providing healing, hospitality, and housing for victims for human trafficking. Tello-Cordon spends a significant amount of her time advocating for youth and volunteers weekly as a group facilitator for a transgender youth group. Following the horrific Orlando, FL, nightclub shooting last June, Tello-Cordon was also on hand as a crisis counselor. Though she says it was incredibly traumatizing and many of the youth she's worked with are still grappling with it, she says she's also felt a sense of strength rise from within the community. "It's reinvigorated a lot of conversations that had fallen silent around issues of homophobia and what it means to be hated for who you are," Tello-Cordon says. "I think a lot of young people had felt things were better and the community had become more accepting, so it was a big shock for them. But we're working through it. At the end of the day I feel like we've come together stronger because of it." Midge Woodard has been a champion for children in Oklahoma foster care as well as children and adults with special needs for more than 30 years. But she says she never imagined doing this kind of work, until she was "hooked" by a case involving a girl named Wanda. "Early on in this career I was involved in an investigation where we found a little girl living in a shed with her mother," Woodard remembers. "I would visit with her and she would always want me to take her to the park. How did I end up in this profession? Wanda led me into it. After that first case, I have spent most of my career working with children in foster care and have become incredibly passionate about it." After taking her first job as a child protection services worker, Woodard quickly gained the expertise to cross over to the Oklahoma Department of Human Services developmental disabilities services division. There she developed policy for the creation of an innovative foster care program for children and adults with developmental disabilities who were being deinstitutionalized in the late '80s. Woodard was also honored as one of a select group of 10 adoption specialists in Oklahoma to place minority children who had special needs. Woodard says that opportunity came through a grant that allowed the state to concentrate on some kids that truly needed permanency in their lives even though they weren't blue eyed with blonde hair. After retiring from her state position of more than 30 years, Woodard came to work for Sunbeam, overseeing the foster care program for 40 foster families. In the last year, her dedication to quality services has resulted in 100% of children in the foster care program being safe and free from findings of any abuse or neglect. Woodard says that she retired on a Friday and went right back to work on a Monday. "I guess I can't sit still," she admits, laughing. "With this kind of work you either love it or you hate it, and I love it. I'm so passionate about it and as long as I can get up every morning and contribute something, then that's what I'll do."